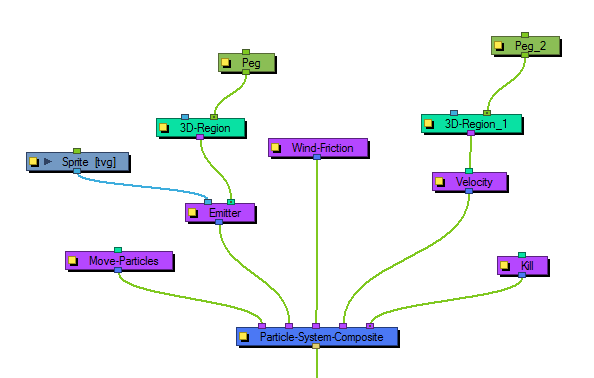 This module allows you to define the amount of wind in the scene, and animate the wind over time. 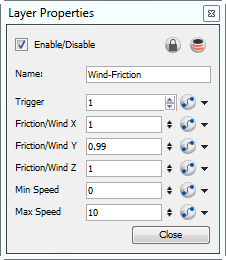 Use the Wind Friction's Layer Properties panel to adjust the effect's parameters. • Friction/Wind X: Defines the amount that the wind will dampen or increase the speed of the particles in the X direction. • Friction/Wind Y: Defines the amount that the wind will dampen or increase the speed of the particles in the Y direction. • Friction/Wind Z: Defines the amount that the wind will dampen or increase the speed of the particles in the Z direction. • Min Speed: The minimum speed of particles that will be affected by the wind. Particles moving slower than this will not be affected. • Max Speed: The maximum speed of particles that will be affected by the wind. Particles moving faster than this will not be affected.